Monday, March 6, 7:30 p.m.
Billy Cox heard Jimi Hendrix playing guitar before he ever laid eyes on the man who would go on to be one of the revolutionary forces of rock 'n' roll. Cox and Hendrix were both teenagers serving in the Army and stationed at Fort Campbell, Ky., in 1961. Cox and a buddy ducked into a building to avoid a rainstorm, and through a cracked window caught some sounds the music-loving Cox had never heard before. "There was a guitar playing, and I told the guy next to me, 'That sounds kind of unique,'" Cox says, the memory still vivid as he recounts it from his Nashville home 56 years later. "And he says, 'That sounds like a bunch of mess!' But he was listening with the human ear, and I think I was listening with the spiritual ear." Cox quickly introduced himself to the aspiring guitarist, and soon he was jamming along on bass as Hendrix developed his style. Joined by a drummer, they gigged around the South and moved to Nashville together before Hendrix left to tour the Chitlin' Circuit as a backing musician—with The Isley Brothers, Little Richard and Curtis Knight—before starting his rise to global fame. 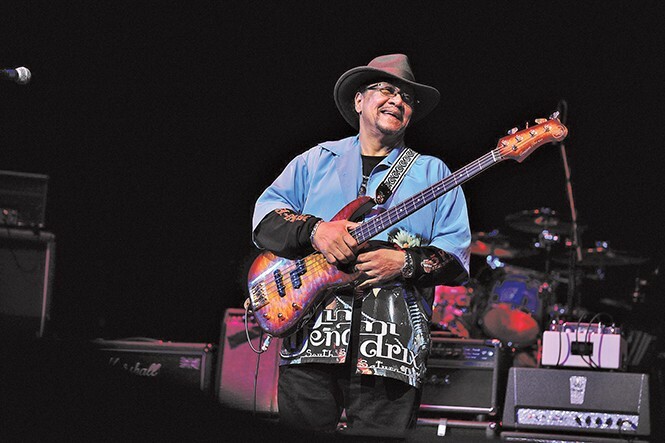 While Hendrix was becoming one of rock's most creative frontmen, Cox continued playing in Nashville, recording and touring with Sam Cooke, Etta James and others. In 1969, Hendrix got back in touch and convinced Cox to join his post-Jimi Hendrix Experience group that performed under myriad names, most notably the Band of Gypsys, at shows like Woodstock and Hendrix's legendary Fillmore East performances. Cox played with Hendrix until the guitarist died in 1970. Cox is now leading the Experience Hendrix Tour, a traveling celebration of Hendrix's songs featuring an incredible array of guitar players, including Buddy Guy, Zakk Wylde, Dweezil Zappa, Keb' Mo', Jonny Lang and more—tearing into classics of the Hendrix canon. There's a reason Hendrix's music still resonates decades after he first heard that distinctive electric squeal, Cox says. And it's a reason that goes back to hearing Hendrix with that spiritual ear. "Every now and then, a spirit slips through a portal in time into this reality and just blows our minds," Cox says. "I think Jimi slipped through that portal, with all the geniuses. "That's why he's just as relevant in the 21st century as he was in the 20th century, because he wrote in the now. A lot of artists don't do that," he says. "You have guys like Bach, Chopin, Handel, Gershwin, Coltrane, Miles. These guys wrote in the now. And the artists who write in the now, they reach down generations and transcend cultural boundaries." The lineup for the Experience Hendrix Tour is testament to how wide-ranging the man's influence is. Guy is a blues legend, while Wylde is renowned as a heavy-metal master. Lang is a modern blues dude, while Zappa specializes in the off-kilter psychedelic freak-outs that were his dad Frank's calling card. Each is a headliner in his own right, and brings a distinct style to the stage. "All these great guitarists who have reputations around the world, they leave their egos at home," Cox says. "We all just have a grand time in the name of good music." The guitarists and Cox are joined by Stevie Ray Vaughan's old drummer Chris Layton, with Henri Brown on vocals, and Cox says the show often reaches two-and-a-half hours. Some of the guitarists stick close to Hendrix's original licks, while others make the songs truly their own. He sees his job as bass man as being no different than when he and Hendrix were creating riffs that Hendrix called "patterns." "You couldn't be restricted by rules and regulations," Cox says. "You had to be in that moment, and I freed myself to just play and be Jimi’s bass player, without regards to showboating or ego. And it worked great.”and be Jimi's bass player, without regards to showboating or ego. And it worked great."